Shane Lowry hits driver off the 10th tee in Wednesday's practice round. For Lowry, this year’s Masters represents a second chance to make up for last year’s missed cut on his debut. And he admits that while his flair and imagination are his key weapons as he tries to follow in the footsteps of the three time Masters champion they call Phil the Thrill, it’s being aggressive that makes him the player he is today. Asked the most impressive player he’s ever teed it up against, Lowry immediately said: “Phil Mickelson. Definitely. Lowry is another gung-ho, go-for-broke player who’s always played off the front foot. And while he has to rein that in at Augusta’s most dangerous holes, he’s still going to play aggressively this week and that means taking his new Srixon driver out of the bag. Asked one to describe his style, he said: “I’m just a very aggressive golfer and I’ve spoke to Graeme McDowell about it. “Unless the pin is cut near the water, I am going at the pin. That’s the way I have played golf all my life. In fact, even if it’s cut near the water, I’m probably still going to go for it. Lowry made six birdies last year but five bogeys and two double bogeys left him a shot outside the cut on three over after rounds of 75 and 72. His big problem last year was his driver and his mistakes led to costly bogeys and double bogeys on three par-fives and the tough, 498-yard 10th and 505-yard 11th holes. Determined not to make the same mistakes this year, Lowry plans to be even more aggressive and hit more drivers. He said: “I think if you look at last year, the likes of the 10th, hitting 3-wood down there for me just made the second shot too hard. “I think I just need to be more aggressive. Five, seven, it’s the same thing; hitting three wood up there, five iron into that green, it’s not really what you want to be hitting. The seventh used to be a three wood or long iron followed by a short iron but at 480-yards it now requires more firepower to a tight fairway to avoid leaving a long approach to a shallow, highly undulating green. 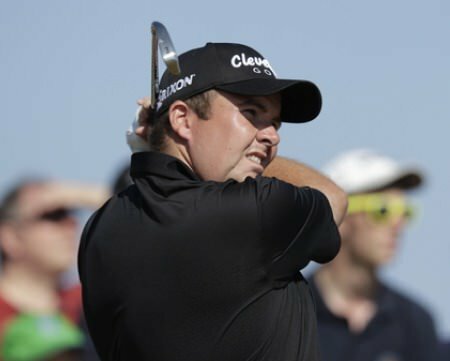 Revealing his strategy, Lowry said: “I hit driver there. Even though it's played downwind the last couple of days, it's been driver-nine iron, driver-wedge. That's such a tough green, if you leave yourself with a mid-iron it makes it very tough. With a 20mph west wind expected, playing the par-fives well is key, as Mickelson explained. He said: “There are no longer any holes outside of the par-fives that are easy birdies, other than No. 3. “They're the only ones that you're going to have easy putts for birdies. You're going to have to make a lot of 20‑ to 40‑footers to make birdies on the other holes. The 13th is the only one he’s wary of after makes a double bogey seven there last year. He said: “I think last year i was getting a bit aggressive with my tee shot and taking too tight a line down the left. “If you look at it, if you hit it in the pine needles up the right it is not the end of the world, you can still chip it down and have a wedge for your third shot. Like Pádraig Harrington and Paul McGinley a few years ago, Tiger Woods reckons Rory McIlroy is just like Phil Mickelson - up one minute and down the next. 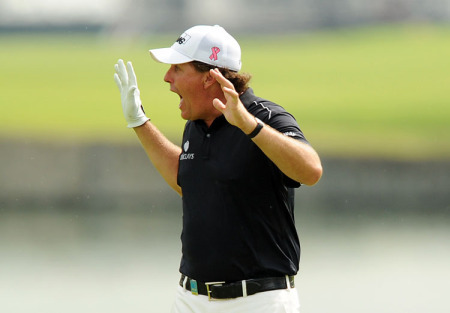 Phil Mickelson believes the secret to Masters success is total aggression.